From early Native American inhabitants to Spanish padres, Mexican generals to itinerant outlaws, Santa Margarita Ranch boasts an illustrious cultural and historical pedigree that is unrivaled on California’s Central Coast. The ranch’s majestic terrain was home to Native Americans for thousands of years. The Salinan and Chumash tribes converged here to live amid the fertile valley soils, mountain forests, plentiful water and abundant wildlife. The ranch was later settled by Franciscan missionaries in the 1770s as part of California’s famed mission trail. The friars raised cattle, planted grapes and established Santa Margarita de Cortona Asistencia as an ”assistance mission” between Mission San Luis Obispo to the south and Mission San Miguel to the north. They also erected the stone-and-mortar Asistencia building (pictured above circa late 1800s). The now-covered walls of the Asistencia still stand today, providing an elegantly rustic backdrop for many weddings and special events. In 1841, the ranch was granted to Joaquin Estrada, a colorful ranchero who was known for hosting grand fiestas and rodeos. Estrada’s gracious hospitality set the tone for generations to come at Santa Margarita Ranch. Since 1999, the 14,000-acre Santa Margarita Ranch has been owned by three longtime local winegrowing and ranching families: the Filipponis, Rossis and Wittstroms. Together, they have advanced the ranch’s legacy of hospitality while preserving its roots as a working cattle ranch and vineyard. The Asistencia building is regarded as the first stone-and-mortar structure built in California. The Asistencia served as a farmhouse, granary, chapel and lodging quarters during the Mission Period. Today, the original building is covered by a protective barn, but the impressive stone walls still stand. California’s original El Camino Real, the 600-mile “Mission Trail” connecting the state’s 21 missions, ran right through Santa Margarita Ranch. Remnants of El Camino Real are still visible today on the ranch. The charming Wells Fargo building dates back to the days when the ranch was an official stagecoach stop for Wells Fargo and other stage lines. The original ranch house still stands today, although its adobe walls are now covered and protected by wood siding. For generations, this house has served as a hub for festivity and hospitality on Santa Margarita Ranch. Franciscan missionaries first planted grapes on the ranch in 1780. A classic head-pruned vineyard was later planted next to the Asistencia sometime in the 1800s. We have planted a new Mission-style vineyard in the same spot to honor the ranch’s winegrowing roots. The establishment of nearby Mission San Luis Obispo de Tolosa in 1772 marked a monumental shift in the local landscape as livelihoods changed from hunting and gathering to farming and animal husbandry. This shift had an immediate—and at times cruel—impact on the local Native American culture. The padres introduced cattle, sheep, horses, farming and viticulture on what is now known as Santa Margarita Ranch. In 1787, Santa Margarita de Cortona was formally recognized as an “assistance mission” to Mission San Luis Obispo. 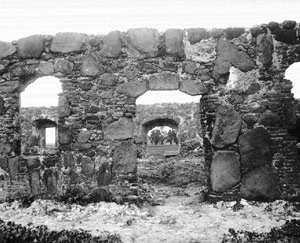 The rock and mortar walls of the original Asistencia building still stand on the ranch today and have been declared a registered California Historical Landmark. After Mexico secured its independence from Spain in 1822, the mission properties were privatized. In 1841, more than 17,000 acres, including what is now known as Santa Margarita Ranch, were granted to 26-year-old Joaquin Estrada. During hostilities between the Mexican and American governments, the ranch was used for strategy meetings led by General Jose Castro and the Mexican Governor of California, Pio Pico. Known for hosting epic rodeos and fiestas, Estrada set the pace for the “early California rancho hospitality” that endures on the ranch today. Drought and debt, however, eventually got the best of Estrada. In 1861, 11 years after California officially became the 31st state in the union, he was forced to sell the ranch to the Murphy family. Santa Margarita Ranch prospered in the hands of Patrick Murphy, who was instrumental in bringing the Southern Pacific Railroad to the area, granting a right-of-way that led to the birth of the town of Santa Margarita. Like Joaquin Estrada, Patrick Murphy was known for hosting large fiestas and rodeos. Local folklore maintains that the notorious brothers Frank James and Jesse James passed through the ranch in 1874 while on the run and heading out to their Uncle Drury’s nearby La Panza Ranch. The ranch was sold to the Reis family in 1901, and it passed through several hands in the ensuing decades. Today, Santa Margarita Ranch is owned by three longtime local families who are dedicated to advancing its heritage as a working ranch and vineyard. The ranch was better and more perfect than we imagined…We’re eternally grateful. Our wedding was amazing! Everyone is still talking about the venue and the train. The facility was magical and amazing…A treasure to behold.